Taking center stage among the bright naked-eye planets this week is the planet Mars, which arrives at opposition to the sun on Saturday (March 3). But while the Red Planet can be seen in clear skies, its two small moons could likely elude many skywatchers. Mars will make its closest approach to Earth on Monday (March 6) when it will be about 62.6 million miles (100.8 million kilometers) from our planet. Currently, Mars is visible all night long, shining like a dazzling yellow-orange "star" that appears low in the eastern sky. The Red Planet sky show begins at nightfall and peaks high in the south shortly after midnight, when Mars will still be visible at dawn as a light low in the western sky. 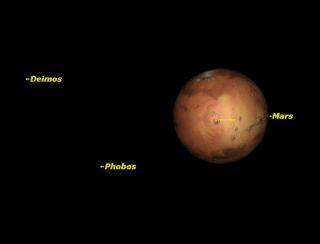 These sky maps of Mars show how the Red Planet will appear in the night sky on Saturday, as well as how to watch the Mars opposition via the Internet. More than a century ago, the famed French astronomer Camille Flammarion speculated on how our Earth would look from Mars. "Our natural vanity might delude us with the idea that the inhabitants of Mars contemplate us in their sky; that they admire us from afar and that they suppose our world to be a celestial abode of peace and happiness," Flammarion wrote. "What a disillusion if they could observe us a little nearer!" The ESA spacecraft Mars Express took this image of Phobos on March 7, 2010. This image has been enhanced for seeing features in the less-illuminated part of the moon. Both Mars moons, Phobos and Deimos, were discovered in August 1877 during a systematic search by Asaph Hall of the U.S. Naval Observatory. Hall actually became so disconsolate after not finding anything that he actually considered giving up the search, but after some encouragement from his wife, he persisted and found two satellites within several nights of each other. Hall aptly named them Phobos (or "Fear") and Deimos ("Panic") after the two sons of Mars who served as his chariot attendants as well as his constant companions. In a side note, nearly three centuries earlier, famed astronomer Johannes Kepler also thought it was possible that Mars possessed two moons Even more remarkable was a description in 1726 by Jonathan Swift in his book "Gulliver's Travels" of astronomers in the land of Laputa who discovered "… two lesser stars, or satellites, which revolve around Mars." Phobos and Deimos are so small that even in large skywatching telescopes they appear as mere points of light. Phobos, the larger of the two measures 14 miles (23 km) across, while Deimos is just 8 miles (13 km) wide. Both satellites revolve around Mars in nearly circular orbits and also very nearly in the plane of the planet’s equator. Phobos orbits a mere 3,700 miles (6,000 km) above the Martian surface. Astronomers have deduced that Phobos is drawing closer to Mars at the rate of 0.7 inches (1.8 centimeters) per year and conceivably could crash into Mars in 40 to 50 million years. Before that happens, however, strong tidal forces induced by Mars should break Phobos into a myriad of particles that would encircle Mars in a series of thin rings. Deimos is a bit farther out at a distance of 12,400 miles (20,000 km). For any latitudes beyond 83 degrees north or south of the equator on the Mars, for example, Deimos can never be seen. Phobos, being the closer of the two moons moves in an even lower orbit and can never been seen from latitudes above 70 degrees north or south of the Martian equator. Because the Mars moons both move almost exactly parallel to the planet's equator, the best views of Deimos and Phobos would be from the Martian equator. But an astronaut, standing there would see these two moons move across the sky in quite different ways. First, keep in mind that like our own Moon, both Deimos and Phobos move in their respective orbits from west to east. Since the Earth rotates from west to east on its axis more than 27 times faster than it takes for the moon to revolve once around the Earth, we're accustomed to seeing it rise in the east, cross the sky and set in the west. This happens because on the Earth's surface we’re all carried along by the Earth’s rotation toward the east, so about every 25 hours we are rotated first toward the moon, before eventually overtaking it and ultimately leaving it behind (in the west). In the case of the Martian moons, Deimos, takes 30 hours 18 minutes to make one swing around Mars. But since it takes Mars 24 hours 37 minutes to make one full turn on its axis, its rotation period comes quite close to matching the time it takes Deimos to make one full circuit around Mars. Similarly, here on the Earth, we have launched many "geosynchronous" satellites carrying payloads up to an altitude of 22,300 miles (35,800 km) where they appear to hover over specific regions of our globe. But since Mars rotates a bit faster than the revolution period of Deimos, we would indeed see it rise in the east, but it would then appear to move across the Martian sky at a very slow pace. In fact, it would take about 33 hours to reach that point directly overhead (or very nearly so). It would then take yet another 33 hours to descend the sky before we would see it finally set in the west. And then, we would have to wait another 66 hours before it again reappears above the eastern horizon! In contrast, Phobos, takes only 7 hours 39 minutes to rotate around Mars. So it has the distinction of being the only moon in the solar system revolving about its primary in a time shorter than the planetary "day," running three laps around Mars each day. As a consequence, as seen from the Martian equator, Phobos appears to move far more rapidly than the sluggish Deimos. In fact, just 2 hours 48 minutes after Phobos has risen, it is already moving overhead. And after another 2 hours 48 minutes it is already setting; an astronaut on Mars could witness it rising twice during a single Martian night. Since Phobos' west-to-east motion is much faster than Mars' rotation period, it would appear to rise in the west and set in the east. Furthermore, about every 10 hours 18 minutes, Phobos appears to rapidly race closely past Deimos as they trek in opposite directions. Phobos, in fact, may even appear to briefly eclipse Deimos for some parts of Mars on each pass. Try picturing this: During the 66-hours that Deimos moves ponderously in the sky toward the west, Phobos appears to whiz rapidly in the opposite direction more than six times! You might also wonder whether Deimos and Phobos can display phases like Earth's moon. Phases, of course, would be dependent on the angle of illumination either moon makes relative to the sun as seen from Mars. In the case of Phobos, it goes through its entire cycle of phases in the short time it takes to go once around Mars. If, for example, it were rising in the west just as the sun was setting, it would be at its "new" phase. A little over four hours later, it will already have moved well past the overhead point to a position roughly halfway up in the east and would appear "full." When it sets in the east about an hour and half later, it will have waned to its Last Quarter phase. Unfortunately, because of the very small size of both satellites, we should not expect to see the same kind of sight that we're accustomed to seeing with our own moon. Deimos, for example, would appear only about one-nineteenth the apparent width of our moon. It would shine at its very best when at its full phase, but because of its very small size it would probably look more like an oversized version of Venus to the unaided eye. Phobos, being the closer and larger of the two moons would appear correspondingly, noticeably bigger and brighter. In apparent size, it would appear about one-third as large as our moon. At its peak brightness, Phobos would shine perhaps 20 times brighter than Deimos. Of course, we know today from photographs taken by spacecraft such as Mariner 9, the Vikings and the Mars Global Surveyor that both are not spheres like our moon, but are rather irregularly shaped lumps, pitted (especially in the case of Phobos) with a variety of craters. One seen on Phobos, measures roughly 6 miles (10 km) across and especially stands out in photographs and has been named "Stickney" in honor of Asaph Hall's wife. Some have suggested that as seen from Mars, Phobos would resemble a shiny potato in the sky. But perhaps science fiction writer Isaac Asimov said it best in his book, "Science, Numbers and I" (Doubleday, 1968) that "… the interplay of light and shadow (on Phobos) will produce a fascinating display of kaleidoscopic change that will never exhaust the fancy." If you snap an amazing photo of Mars or any other skywatching target and would like to share it for a possible story or image gallery, please contact SPACE.com managing editor Tariq Malik at tmalik@space.com.